I hate it. I hate it because all it says is that each type, x, is at a frequency Px of the total population, so those Px sum to one. But of course. I just don't think this kind of writing is conducive to discourse, because in biology there is already a huge gap between the majority who don't read (and cite) papers with equations, and those who write them. So why muddy the waters with equations like this that says next to nothing? 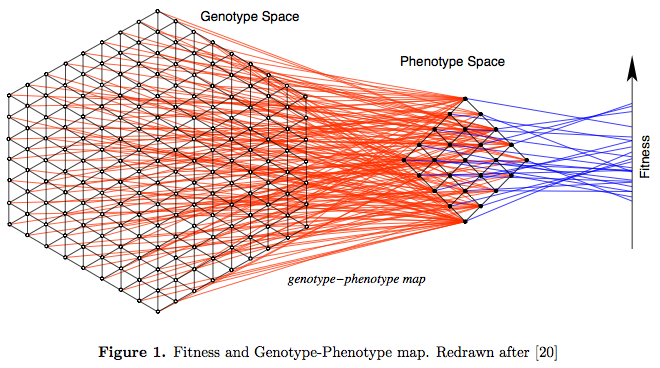 However, I reiterate (and is why I'm reading the chapter) that this figure of a genotype-phenotype-fitness map is super cool.There are many more different genotypes (the genetic make-up of an organism) than there are different phenotypes (the combined physical attributes of the organism). This must be so, because we now know that each trait is affected by many genes; it takes more than one gene to make a trait (there may be exceptions where only one gene encodes a trait). A testable genotype-phenotype map: Modeling evolution of RNA molecules. In: Lässig, M. and Valleriani, A., editors, Biological Evolution and Statistical Physics, pp. 56–83. Springer-Verlag, Berlin, 2002. I echo your sentiments: That's a gorgeous figure, conceptually. "There are many more different genotypes (the genetic make-up of an organism) than there are different phenotypes (the combined physical attributes of the organism). This must be so, because we now know that each trait is affected by many genes; it takes more than one gene to make a trait (there may be exceptions where only one gene encodes a trait)." There's a more profound implication there. Many more different genotypes than phenotypes means many genotypes code for the same phenotype. Many solutions to the same problem = robustness. Yes, there is of course robustness in that redundancy. Thanks for pointing that out. The set notation is not annoying to read if you've had years of math training. If you see tens of those everyday, reading them becomes second nature, kinda like how regular reading was slow and painful at first (when we were, say, 5), but it was much easier at 10. Is it reasonable for everyone to be fluent in math notation? That's up for debate, but I don't think so. I don't think the author is fluent himself, since the set-builder condition doesn't have proper syntax (for starters, the universal quantifier is in the wrong place). Anyways, the g-p map diagram is gorgeous.